Weatherbury Farm is a certified organic sustainable family farm located in the rolling hills of southwestern Pennsylvania. It is a quiet place, far from the madding crowd, removed from the cares of the world. Here meadows and gardens, fields and valleys combine to create a perfect setting of tranquil relaxation. The gentle amenities of life are still observed. Weatherbury Farm grows certified organic grains and mills them into flour. From putting the seed in the ground to putting the flour in the bag, everything is done at the farm. The flours, ground slowly and at a low temperature on a stone mill, retain the grain’s vitamins, minerals, oils and fiber giving the flours their delicious unique flavors. Weatherbury Farm has sold grass fed/ grass finished beef and lamb directly to the consumer since 2007. No pesticides, herbicides, antibiotics, artificial steroids or growth hormones are used. Weatherbury’s cows and sheep are born and live their entire life on the farm. Weatherbury’s cattle rotationally graze on certified organic grass, eat certified organic hay during non-grazing times. And the cows’ bedding is “certified organic” straw. Weatherbury’s chickens free range on the farm and eat certified organic grains raised on the farm. Certified organic eggs are available for sale to consumers on the farm. Since 2009, certified organic grains (soft & hard wheat, oats, spelt, open-pollinated corn, emmer and einkorn) have also been grown on the farm. (We have farmed without herbicides, pesticides, and chemical fertilizers since 1988.) We sold our grains to a regional flour mill, a micro-distillery, a micro-brewery and to other farmers. Then, in April 2014, we began milling flour for sale directly to consumers. With our flour milling operation, we are doing something that is truly unique. In the news today, you hear about food miles and how the average meal travels 1500 miles to the plate passing many processing plants on the way. This uncertainty of where your food has been and what has been done to it along the way creates the demand that our products fill. From putting the seed into the soil to putting the flour into the bag all of the operations of planting, harvesting, grain cleaning and milling happen on our farm. Weatherbury Farm is the only small farm producing estate flours, akin to an estate wine. The consumer can rest assured because our products are organically grown and processed. The organic certification means we have a rigorous annual inspection which verifies that our inputs, farming methods and processing are compliant with the USDA National Organic Program. Selling direct to consumers allows us to cultivate relationships with the people whom our food nourishes. Currently all of our products are for pickup on the farm so people have the opportunity to learn where their food comes from. Weatherbury’s milled products are also available to the greater Pittsburgh region through Penn’s Corner Farmstand and are also be available for sale on the farm, on scheduled pickup days. Weatherbury Farm is constantly growing. From 2007 to 2017, by taking on other farms in the area, our land base has tripled. In 2013 we took on additional traditionally farmed acreage and transitioned it to organic. Additional organic acreage was taken on in 2015, 2016 and 2017. We are always looking for ways we can leverage our resources to create new marketable products. For example, in 2012 we grew rows of dry beans in our garden to determine which varieties will work the best with our planned system. Then in 2013 we began growing black turtle dry beans which we harvested, cleaned and sold directly to customers. While we don’t have the textbook machinery for a large dry bean operation, we have found creative ways to adapt the machines we already have to get the job done. 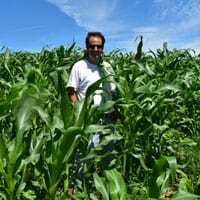 Farmer Nigel is working with the Organic Growers Research and Information Sharing Network (OGRIN) to determine optimum varieties and cultural practices for heritage and alternative grain production in the northeast. He is also working with the Heritage Wheat Conservancy to bring einkorn, the world’s oldest cultivated grain, back as a commercial crop. A local friend who runs a CNC machine recently brought his employee over to show him our forge and machine shop. While they were here, we showed them some of our other projects that will be coming to fruition. As they were leaving, our friend told us that his employee said to him “this is the way real Americans are supposed to be”. The creative spirit is alive and well at Weatherbury Farm. Farm duties: In charge of field operations, feeding animals, overseeing herd and flock. Oversaw breakfast preparation and chores with guests. Other: Dale served as president from 2009 through 2011 of the Avella Community Association. Dale serves on the Independence Township planning commission and served on the Independence Township Community Center Board; he previously served on the township zoning hearing board and the township Ag Security Committee. Dale grew up on a small farm in Williamsport PA and at age 10 had his own business raising and direct marketing strawberries. Farm Duties: Field work, organic grains, planning, keeper of organic records for farm and gardens. During farm stay years, he helped with breakfast preparation. Nigel was the impetus behind Weatherbury Farm adding certified organic grains which in turn led to flour milling. and pasta making. 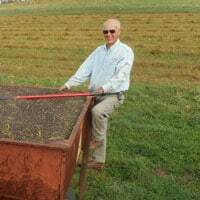 His meticulous note keeping and farm management helped us win the Pennsylvania Certified Organic 2012 Sustainability Award. Occupation (in addition to farming): Architectural blacksmith. He studied blacksmithing (selected by ABANA — the Artist Blacksmith Association of North America) in Aachen Germany in 2001. He taught blacksmithing at Touchstone Center for the arts for many years. Other: Nigel worked with Marcy to manage the Avella Farmers Market in 2007 & 2008. Nigel currently serves on the zoning hearing board for Independence Township. He also served on the PASA western region advisory committee. Occupation: Self-employed accountant. Previously worked in accounting and personnel in corporate, state and military positions. Marcy served as a captain in the US Air Force in the Vietnam theater. Hobbies: Travelling, gardening, needlework, beginning hammered dulcimer player. Other: Marcy was the President of the Pennsylvania Farm Vacation Association from 1994 – 2008 and from November 2011 to November 2015 served as the Association manager. 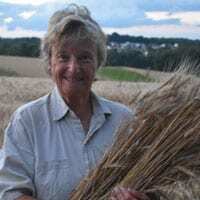 Because of her involvement with PFVA, she traveled to Poland in 2001 to study agri-tourism in that country. Marcy was the market manager for the Avella Farmers Market (2007 & 2008). She served as treasurer of the Pittsburgh Bed and Breakfast Association from 2006 – 2015. She previously served as an auditor and as the chair of the Community Center Board for Independence Township. Marcy volunteered with IRS Volunteer Income Tax Assistance program both in Avella and previously when living in Pittsburgh.